Example code for FAQ Good practices: "What is the best way of handling data in file pairs (or triplets etc.)?" Ruffus is a Computation Pipeline library for python. It is open-sourced, powerful and user-friendly, and widely used in science and bioinformatics. Ruffus is designed to allow scientific and other analyses to be automated with the minimum of fuss and the least effort. 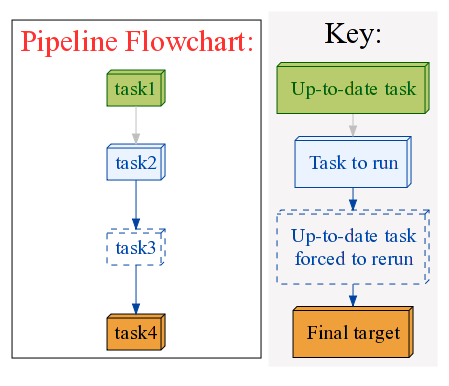 Scalable: Handles even fiendishly complicated pipelines which would cause make or scons to go cross-eyed and recursive. Standard python: No "clever magic", no pre-processing. Unintrusive: Unambitious, lightweight syntax which tries to do this one small thing well. Please join me (email: ruffus_lib at llew.org.uk) in setting the direction of this project if you are interested. Ruffus is available as an easy-installable package on the Python Package Index. The Ruffus project is hosted with Google Code here. Check out the mailing list without subscribing here. Bugs or feature requests can be posted here. © Copyright 2009-2015 Leo Goodstadt.